We are pleased to announce that the Beginners lesson pack has been expanded with the addition of a new fun lesson for children to CAD model. After feedback from our schools we decided to create a new modelling lesson that will help prepare students for the design challenge and allow teachers to spend more time learning CAD modelling with their classes. The ability to CAD model is the core of what 3D printing is about. The more confident that children can get using CAD, the better equipped they will be to develop their understanding of how to solve design problems. 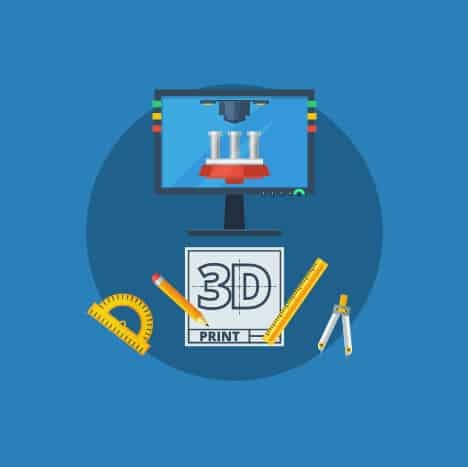 The new lesson also gives teachers more curriculum content to teach resulting in more time 3D printing. The new lesson is designed by last one hour and teaches children how to design a ‘smartphone stand’. 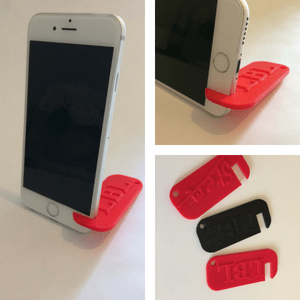 The stand doubles as a key-ring allowing for children to easily prop up their smartphones when watching YouTube or face- timing friends where ever they are. The concept behind the lesson is to allow children to create a model that can be printed in under 30 minutes. For a teacher this will allow a quick turn around when 3D printing a class set of files. Also due to the small nature of the design, it will also mean a budget friendly project. In keeping with the rest of the curriculum, there is a lesson plan, teaching powerpoint, lesson worksheet with answers, homework worksheet with answers and also example STL files to print off. All that the teacher needs to do is pre-print some example files to show the class. One feature of the lesson to encourage numeracy skills is the need to accurately measure the thickness of their smart phone. This can be done with measuring vernier calipers (bringing in a new tool and engineers skills) or with a standard ruler. From our experience of trialling this lesson, modelling this is one of the most challenging aspects of the lesson, ensuring that the slot for the smartphone is accurate enough to support the phone. The final aspect of the lesson which makes it really enjoyable and fun for children, is the use of the ‘scribble feature’ in TinkerCAD. This allows children to express their creative side and customise the design to their own ideas. The lesson will up-skill children’s understanding of 3D CAD further and also add to their understanding with the extra lesson task worksheet and homework tasks. As with all the lessons they come with answer sheets so the students can self assess or peer assess their work, reducing the teacher time spend marking work. This lesson comes as part of the ‘Beginners lesson pack.’ It is also included in the ‘Beginners and Intermediate lesson bundle‘ and the ‘Whole curriculum bundle’. If you already have the curriculum and want to update your current version, then buy the curriculum add on pack here. Curriculum update - we've added a new Fusion 360 lesson.